These little minis are perfect for a special treat in a lunchbox, too! If you don’t have a stand mixer, you can certainly make this by hand. Don’t be intimidated if you’ve never made a yeast dough before; this one is very forgiving. In the bowl of a stand mixer fitted with a dough hook, combine the 1 1/2 cups warm water with the yeast, brown sugar, and salt. Mix until everything is dissolved, then gradually add the bread flour, regular flour, and carrots. Mix at medium speed until the dough just starts to come together. Add the raisins and continue to mix until the dough pulls away from the sides of the bowl in a ball. Turn it out onto a lightly floured surface and knead it until it’s smooth and elastic, then place on a greased baking sheet, cover with a tea towel, and let rise for about 30 minutes, until doubled in size. Divide the risen dough into 24 pieces (this is for miniature pretzels — if you want full-sized ones, divide into 12 pieces). Roll each piece into a rope, about 6-8 inches long and less than 1/2 inch thick. Twist into pretzel shapes. In a large bowl, combine the baking soda and boiling water. Using a slotted spoon, dip the pretzels into the water bath, then place them on a greased sheet pan. Let the pretzels rise, uncovered, for another 30 minutes. Bake at 450 degrees for 10 minutes, until golden brown. Brush with the melted butter, then combine the cinnamon and sugar and sprinkle over the tops of the finished pretzels while still warm. Variations: You can omit the carrot altogether and knead 2 tsp. 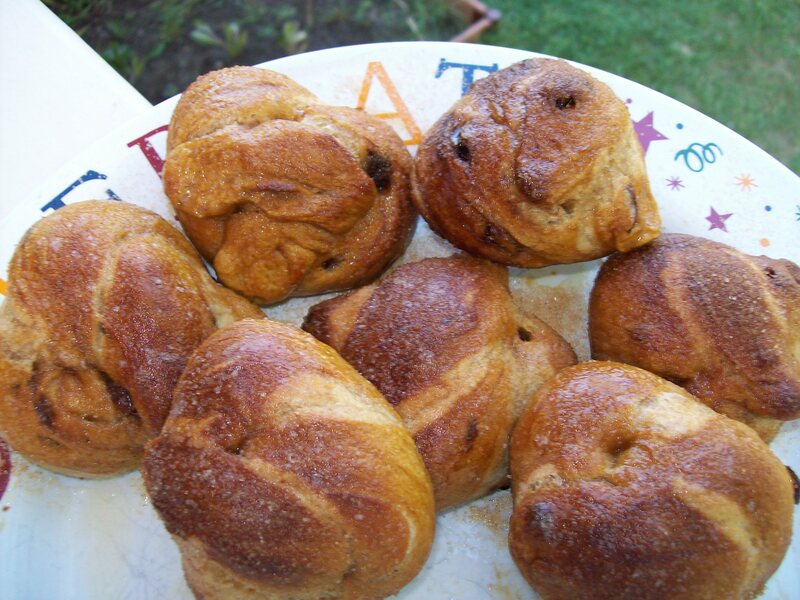 of cinnamon into the dough with the raisins. For a savory twist, omit the carrots and raisins and knead 2 tsp. of garlic powder and an extra 1/2 tsp. of salt into the dough. When the savory pretzels are finished, brush with butter and sprinkle with coarse salt.